It’s no secret that the decade of decadence is making waves throughout the fashion community. We are seeing more and more men and women invest in quality, wardrobe staples that are essential for any outfit, like a great jacket and well made denim! One of my favorite trends to hit the runway last fall were high waisted, denim trousers. Yes! 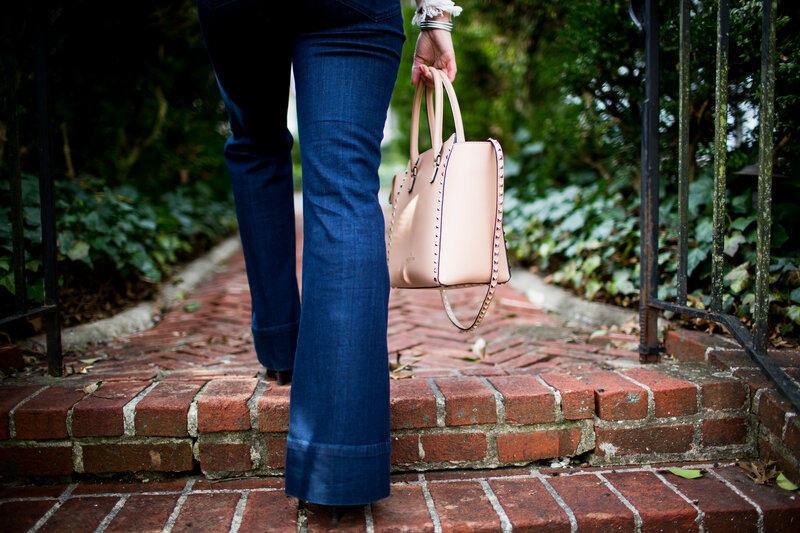 Flares are just about the most exciting thing to happen to denim since the advent of skinny jeans. It’s a trend that is proving to have some serious staying power, and any skeptics should have attended the Create & Cultivate conference in Dallas, Texas, which resembled an incredibly chic version of That ’70s Show. COLOR: Try flares in other colors and prints. 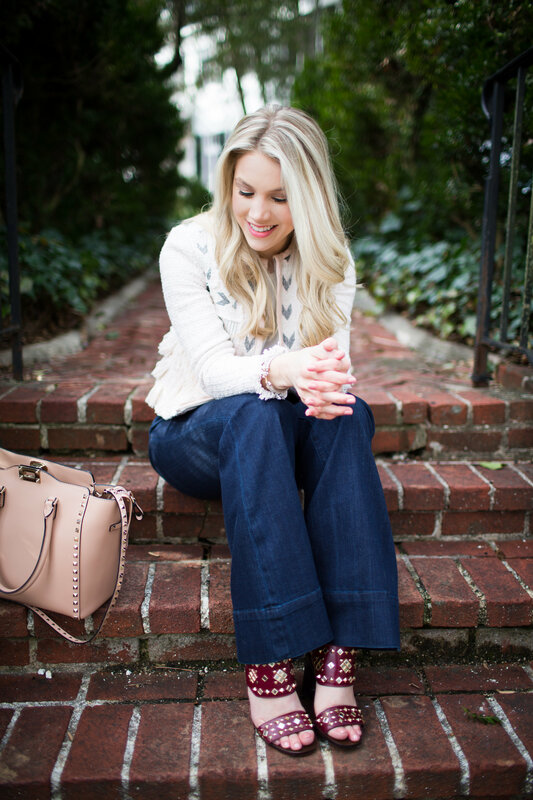 A pair of crisp white flares works perfectly with a denim or chambray skirt. Pull it together with black or brown accessories and you’ve got a classic American look. BELT: Pair your high waisted trousers with a wide belt and a tucked in top for effortless glamour! This combination is super slenderizing too! 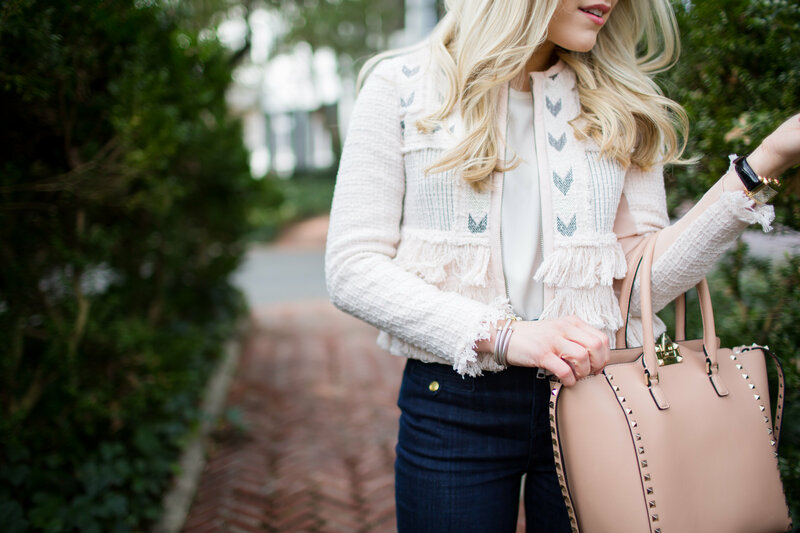 JACKET: Add a pop of color with a great jacket or handbag, like the tweed Rebecca Taylor crop jacket worn in today’s post! HEM: Play with volume and look for flares with a 3/4” thick hem, like this pair from Anthropologie. TAILORED: Ladies, tailor your denim to the shoes you plan to wear so that the pant leg falls even with the ground. This should be a no brainer! 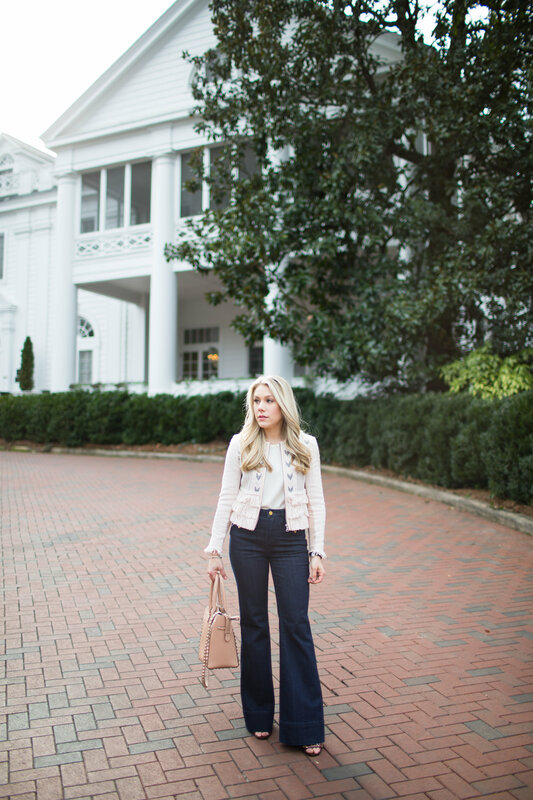 As Spring approaches, we are seeing more and more designer collections emerge that also adorn 70’s inspired pieces, like the tweed Rebecca Taylor Crop Jacket worn in today’s post. It’s intricate design and fringe detail immediately captured my attention, and I knew I wanted to pair it with high waisted, denim trousers. The jackets crop fit also aided in elongating my 5’3” stature. Speaking of which, I have never received more compliments on an article of clothing in my entire life. Seriously! I wore this combination to Create & Cultivate several weeks ago and was being identified as “the girl in the pink jacket!”. If you haven’t already clicked on the direct link above, please know that this blush beauty is certainly an investment piece! Luckily, it is marked down half of its original price, so run don’t walk. I was a little hesitant to pull the trigger, but I can honestly say that this jacket has received some major milage over the past several weeks. Yesterday, I paired it with a pair of black joggers, and Nike Free’s – an unusual combination that came together really well. What I love most about this look is that it screams 70’s while remaining authentic to my personal style. While this outfit was created entirely from what I consider to be wardrobe staples, they can easily be paired with other budget conscious pieces to create an entirely different look. As for my accessories, I paired it with my everyday bracelets, pearl ear jackets, and these fabulous marsala Tory Bruch wedges. I love the combination or blush and burgundy, and felt that they contrasted the top while complimenting the denim’s dark wash. They too are half off! Thank you so much for your kind words and continued support. I enjoy reading all of your sweet comments on Instagram and Facebook. I’m hosting another giveaway below for my fabulous followers for the chance to win $500 shopping spree! See below for details. Also, if you are interested in a recap of my Create & Cultivate experience please let met know! You are adorable!! That jacket, those sandals…I’m swooning here, just love this whole look!! Thank you SO much! You are so kind, Andrea! The jacket was one that I just couldn’t pass up! I’m love wearing mine! I just purchased a white pair, and can’t wait to pair them with a chambray top! I agree, SO slimming! 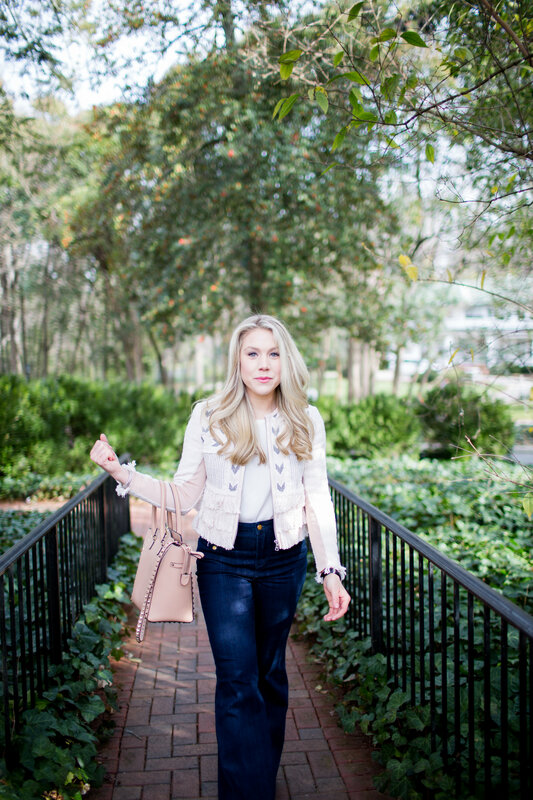 I’m loving this entire look from the flare jeans to the jacket! Thank you so much, Nicole! 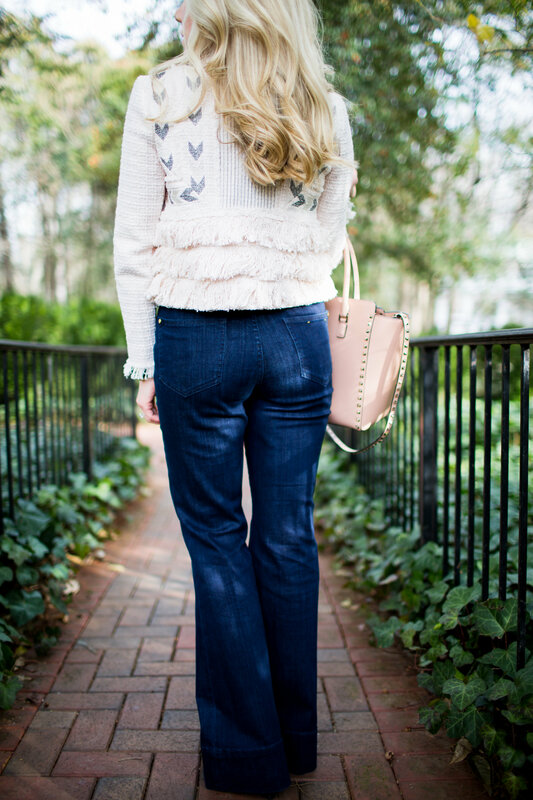 I love flared denim. 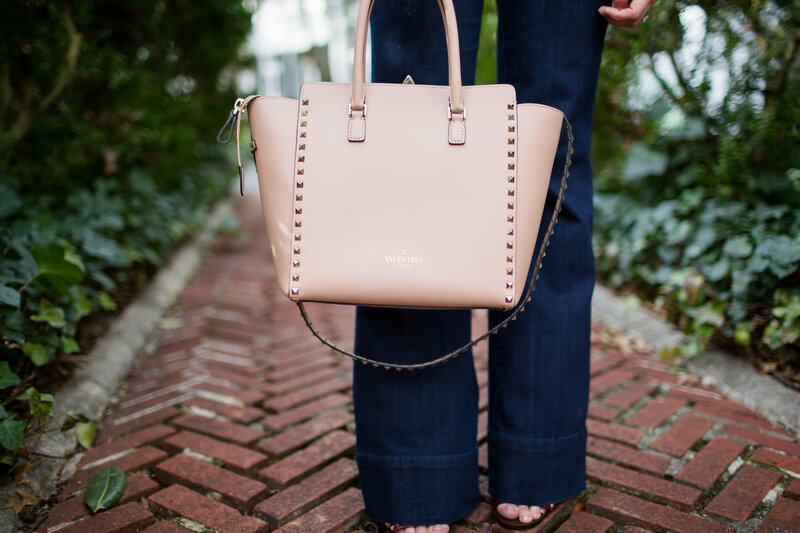 You can pair them with a plain tee and instantly look chic! You look so stunning in that outfit! Want that jacket too-it is just the perfect amount of feminine. THAT JACKET!!!!! OMG!!!! how many details about it do i love?!?! SO MANY!!! EEEK!!!! and with the flares it’s just perfect. you have great style.